This article is about the Islamic era. For discussion of the migration to Medina itself, see Hijra (Islam). The Hijri year (Arabic: سَنة هِجْريّة‎) or era (التقويم الهجري at-taqwīm al-hijrī) is the era used in the Islamic lunar calendar, which begins its count from the Islamic New Year in 622 CE. 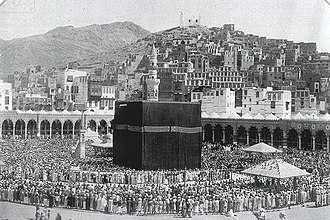 During that year, Muhammad and his followers migrated from Mecca to Yathrib (now Medina). This event, known as the Hijra, is commemorated in Islam for its role in the founding of the first Muslim community (ummah). In the West, this era is most commonly denoted as AH (Latin: Anno Hegirae /ˈænoʊ ˈhɛdʒɪriː/, "in the year of the Hijra") in parallel with the Christian (AD), Common (CE) and Jewish eras (AM) and can similarly be placed before or after the date. In Muslim countries, it is also commonly abbreviated H ("Hijra") from its Arabic abbreviation hāʾ (هـ). Years prior to AH 1 are reckoned in English as BH ("Before the Hijra"), which should follow the date. The date of the Hijra itself did not form the Islamic New Year. Instead, the system continues the earlier ordering of the months, with the Hijra occurring around the 8th day of Rabi al-Awwal, 66 days into the first year. By the age of Muhammad, there was already an Arabian lunar calendar, with named months. Likewise, the years of its calendar used conventional names rather than numbers: for example, the year of the birth of Muhammad and of Ammar ibn Yasir (570 CE) was known as the "Year of the Elephant". The first year of the Hijra (622-23 CE) was named the "Permission to Travel" in this calendar. 17 years after the Hijra, a complaint from Abu Musa Ashaari prompted the caliph Umar to abolish the practice of named years and to establish a new calendar era. Umar chose as epoch for the new Muslim calendar the hijrah, the emigration of Muhammad and 70 Muslims from Mecca to Medina. Tradition credits Othman with the successful proposal, simply continuing the order of the months that had already been established, beginning with Muharram. Adoption of this calendar was then enforced by Umar. Given that the Islamic New Year does not begin January 1 and that a Hijri year is 11 days shorter than a Common Era year, there is no direct correspondence between years of the two eras. A given Hijri year will usually fall in two successive Western years. A Western year will always fall in two or occasionally three successive Hijri years. For example, the year 2008 CE maps to the last week of AH 1428, all of 1429, and the first few days of 1430. Similarly, the year 2041 CE will correspond with the last few days of AH 1462, all of 1463, and the first week of 1464. ^ See List of Islamic years#Modern. ^ It is sometimes mistakenly placed on July 16. The error derives from the tabular Islamic calendar which was devised by later Islamic astronomers. This reckons time backwards according to the lunar calendar, which causes it to miss the three intercalary months (about 88 days) added to the then-lunisolar calendar between the time of the Hijra and AH 10, when Muhammad is recorded as having received a revelation prohibiting their use. ^ Official site, Government of Sharjah, retrieved 21 January 2017 . ^ Fazlur Rehman Shaikh, Chronology of Prophetic Events (London: Ta-Ha Publishers Ltd., 2001), p. 157. ^ a b c Aisha El-Awady (2002-06-11). "Ramadan and the Lunar Calendar". Islamonline.net. Retrieved 2006-12-16. ^ Hakim Muhammad Said (1981). "The History of the Islamic Calendar in the Light of the Hijra". Ahlul Bayt Digital Islamic Library Project. Retrieved 2006-12-16. ^ Umar bin Al-Khattab (2002). "Islamic Actions and Social Mandates: The Hijri Calendar". witness-pioneer.org. Retrieved 2006-12-16. ^ Clark, Malcolm (2013). Islam for dummies. Hoboken, N.J.: John Wiley & Sons. p. 489. ISBN 1118053966. ^ Hodgson, Marshall G. S. (1977). 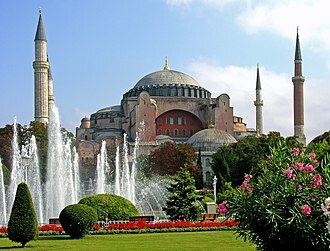 The venture of Islam conscience and history in a world civilization. Chicago: University of Chicago Press. p. 21. ISBN 0226346862. ^ ""Islamic New Year Observed Today; President Airs Wish for Peace on Amon Jadid Exhorts Muslims to Assist in Nat'l Resurgence" - Manila Bulletin, January 20, 2007 | Questia, Your Online Research Library". Questia.com. Retrieved 2013-05-22. ^ "Islamic New year to be observed on 11th January | AAJ News". Aaj.tv. 2008-01-10. Retrieved 2013-05-22. F. A. Shamsi (1984). "The Date of Hijrah". Islamic Studies. 23: 189–224 & 289–332. Wikisource has the text of a 1911 Encyclopædia Britannica article about Hijri year. Today's full Hijri date in Mecca. Islamic studies is the academic study of Islam and Islamic culture. Islamic studies can be seen under at least two perspectives, From a secular or neutral point of view, Islamic studies do academic research on Islam and Islamic culture independent of faith. In this respect, Islamic studies neither engage in shaping Muslim faith by making Islamic theology, from a Muslim point of view, Islamic studies do academic research on Islam and Islamic culture, but from a faithful perspective. Historically, both perspectives had been separated by the separation of the Western and Islamic worlds. They differed in their understanding of academia and were organized either in universities or madrasas, scholars of Islamic studies are called by their special field of study, as e. g. historian, sociologist, or political scientist, or in general a scholar of Islamic studies. The professional title Islamicist is dated, scholars of Islamic studies from a faithful point of view can be historians etc. too, yet they can be called Muslim scholar, teacher of religion, cleric, or Ulama. In a Muslim context, Islamic studies is the term for the Islamic sciences. Specialists in the discipline apply methods adapted from several fields, ranging from Biblical studies and classical philology to modern history, legal history. Scholars in the field of academic Islamic studies are often referred to as Islamicists, in fact, some of the more traditional Western universities still confer degrees in Arabic and Islamic studies under the primary title of Oriental studies. This is the case, for example, at the University of Oxford, the first attempt to understand Islam as a topic of modern scholarship was within the context of 19th-century Christian European Oriental studies. Some orientalists praised the tolerance of Islamic countries in contrast with the Christian West. In the 2nd half of the 19th century and historical approaches were predominant, leading in the field were German researchers like Theodore Nöldeke s study on the history of the Quran, or Ignaz Goldziher s work on the prophetic tradition. Iman in Islamic theology denotes a believers faith in the metaphysical aspects of Islam. Its most simple definition is the belief in the six articles of faith, the term Iman has been delineated in both the Quran as well as the Hadith of Gabriel. According to the Quran, Iman must be accompanied by righteous deeds, in the Hadith of Gabriel, Iman in addition to Islam and Ihsan form the three dimensions of the Islamic religion. There exists a debate both within and outside Islam on the link between faith and reason in religion, and the importance of either. 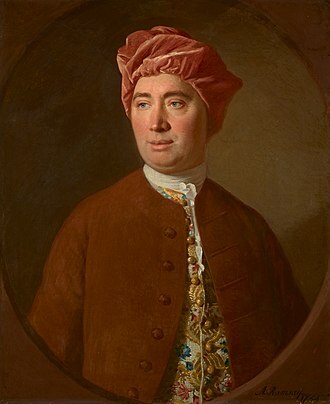 Several scholars contend that faith and reason spring from the source and hence must be harmonious. In Arabic, pronounced means faith and it is the verbal noun of آمَنَ to believe. In a hadith, Muhammad defined iman as a knowledge in the heart, a voicing with the tongue, Faith is confidence in a truth which is real. When people have confidence, they submit themselves to that truth, hamiduddin Farahi, while explaining the meaning of Imān in his exegesis, The root of imān is amn. It is used in various shades of meaning, one of its derivatives is mumin, which is among the noble names of Allah because He gives peace to those who seek His refuge. This word is an ancient religious term, another similar narration ascribed to Muhammad is, Ibn Abbas narrates that the Angel Jibril once asked the Prophet, Tell me what is Iman. Jibril asked him, If I do all this will I be with Iman, the Prophet said, When you have done all of this, you will be having Iman. It is assumed that the essential Iman consists of the first 3 items, in the Quran, Iman is one of the 10 qualities which cause one to be the recipient of Gods mercy and reward. The Quran states that faith can grow with remembrance of God, the Quran states that nothing in this world should be dearer to a true believer than faith. Muhammad is reported to have said that he gained sweetness of faith who was pleased to accept God as Lord, Islam as religion and he said that no one can be a true believer unless he loves the Prophet more than his children and relatives. Salah, called namāz in some languages, is one of the Five Pillars in the faith of Islam and an obligatory religious duty for every Muslim. It is a physical and spiritual act of worship that is observed five times every day at prescribed times, in this ritual, the worshiper starts standing, prostrates themself, and concludes while sitting on the ground. During each posture, the worshiper recites or reads certain verses, the word salah is commonly translated as prayer but this definition might be confusing. Muslims use the words dua or supplication when referring to the definition of prayers which is reverent petitions made to God. Salah is preceded by ritual ablution, Salah consists of the repetition of a unit called a rakʿah consisting of prescribed actions and words. The number of obligatory rakaʿāt varies from two to four according to the time of day or other circumstances, prayer is obligatory for all Muslims except those who are prepubescent, are menstruating, or are experiencing bleeding in the 40 days after childbirth. Every movement in the salat is accompanied by the takbir except the standing between the ruku and sujud, and the ending which has a derivation of the Muslim greeting As-salamu alaykum, Salah is an Arabic word whose basic meaning is bowing, worship, prayer. 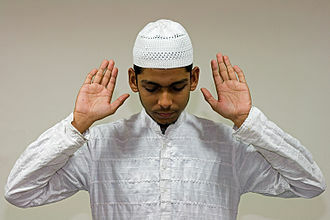 In its English usage, the reference of the word is almost always confined to the Muslim formal, Muslims themselves use several terms to refer to salah depending on their language or culture. In many parts of the world, including many non-Arab countries such as Indonesia, the other major term is the Persian word namāz, used by speakers of the Indo-Iranian languages, as well as Turkish, Chinese and Albanian. 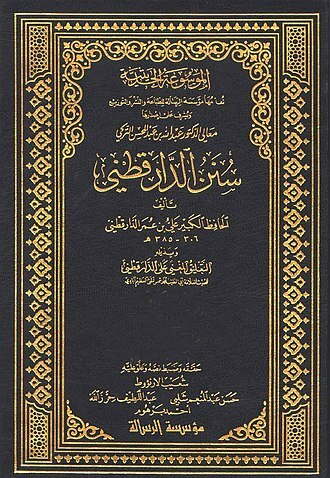 In North Caucasian languages, the term is lamaz in Chechen and this is a book, there is no doubt in it, a guidance for righteous. Those who believe in unseen and offer Salah and spend from what we have given to them, and those who believe in what We have revealed to thee and what We revealed before thee, and on hereafter they believe. They are on guidance from their lord and they are successful, and offer Salah and pay Zakah and bow along those who bow. Madrasa is the Arabic word for any type of educational institution, whether secular or religious. The word is variously transliterated madrasah, madrassa, medrese, in the West, the word usually refers to a specific type of religious school or college for the study of the Islamic religion, though this may not be the only subject studied. In countries like India, not all students in madrasas are Muslims, the word madrasah derives from the triconsonantal Semitic root د-ر-س D-R-S to learn, through the wazn مفعل‎, mafʻal, meaning a place where something is done. Therefore, madrasah literally means a place where learning and studying take place, for example, in the Ottoman Empire during the Early Modern Period, madaris had lower schools and specialised schools where the students became known as danişmends. The usual Arabic word for a university, however, is جامعة, the Hebrew cognate midrasha connotes the meaning of a place of learning, the related term midrash literally refers to study or learning, but has acquired mystical and religious connotations. However, in English, the term usually refers to the specifically Islamic institutions. 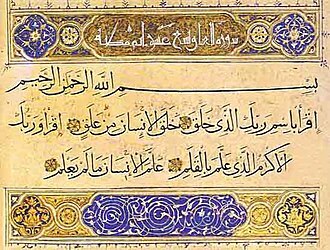 A regular curriculum includes courses in Arabic, sharīʻah, mantiq, in the Ottoman Empire, during the Early Modern Period, the study of hadiths was introduced by Süleyman I. Depending on the demands, some madaris offer additional advanced courses in Arabic literature and other foreign languages, as well as science. Ottoman madaris along with religious teachings taught styles of writing, syntax, composition, natural sciences, political sciences, people of all ages attend, and many often move on to becoming imams. The certificate of an ʻālim, for example, requires approximately twelve years of study, a good number of the ḥuffāẓ are the product of the madaris. The madaris resemble colleges, where people take evening classes, an important function of the madaris is to admit orphans and poor children in order to provide them with education and training. Madaris may enroll female students, they study separately from the men, the term Islamic education means education in the light of Islam itself, which is rooted in the teachings of the Quran - holy book of Muslims. Islamic culture is a term primarily used in secular academia to describe the cultural practices common to historically Islamic people. The early forms of Muslim culture were predominantly Arab, Islamic culture generally includes all the practices which have developed around the religion of Islam, including Quranic ones such as prayer and non-Quranic such as divisions of the world in Islam. It includes as the Baul tradition of Bengal, and facilitated the conversion of most of Bengal. There are variations in the application of Islamic beliefs in different cultures, Islamic culture is itself a contentious term. Muslims live in different countries and communities, and it can be difficult to isolate points of cultural unity among Muslims. Anthropologists and historians nevertheless study Islam as an aspect of, and influence on, the noted historian of Islam, Marshall Hodgson, noted the above difficulty of religious versus secular academic usage of the words Islamic and Muslim in his three-volume work, The Venture Of Islam. He proposed to resolve it by using these terms for purely religious phenomena. However, his distinction has not been widely adopted, early Muslim literature is in Arabic, as that was the language of Muhammads communities in Mecca and Medina. As the early history of the Muslim community was focused on establishing the religion of Islam, see the articles on Quran and Sirah, which formed the earliest literature of the Muslim community. With the establishment of the Umayyad empire, see The Book of One Thousand and One Nights. While having no content, this secular literature was spread by the Arabs all over their empires. By the time of the Abbasid empire, Persian had become the language of Muslim World. Much of the most famous Muslim literature was written in Persian, from Rumi in Anatolia, to Nizami in the Caucasus, to Jami in Samarkand, from the 11th century, there was a growing body of Islamic literature in the Turkic languages. However, for centuries to come the official language in Turkish-speaking areas would remain Persian, in Anatolia, with the advent of the Seljuks, the practise and usage of Persian in the region would be strongly revived. The Five Pillars of Islam are five basic acts in Islam, considered mandatory by believers and are the foundation of Muslim life. They are summarized in the hadith of Gabriel. The Shia and Sunni both agree on the details for the performance and practice of these acts, but the Shia do not refer to them by the same name. They make up Muslim life, concern for the needy, self-purification, shahada is a declaration of faith and trust that professes that there is only one God and that Muhammad is Gods messenger. 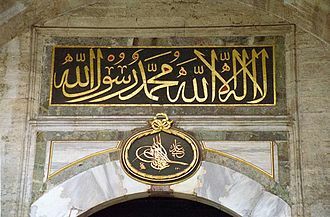 It is a set statement normally recited in Arabic, lā ʾilāha ʾillā-llāhu muḥammadun rasūlu-llāh There is no god but God Muhammad is the messenger of God and it is essential to utter it to become a Muslim and to convert to Islam. Salat consists of five daily prayers according to the Sunna, the names are according to the times, Dhuhr, ʿAṣr, Maghrib. All of these prayers are recited while facing in the direction of the Kaaba in Mecca, Muslims must wash before prayer, this washing is called wudu. The prayer is accompanied by a series of set positions including, bowing with hands on knees, a Muslim may perform their prayer anywhere, such as in offices and fields. However, the mosque is the more preferable place for prayers because the mosque allows for fellowship, Zakāt or alms-giving is the practice of charitable giving based on accumulated wealth. The word zakāt can be defined as purification and growth because it allows an individual to achieve balance, the principle of knowing that all things belong to God is essential to purification and growth. Zakāt is obligatory for all Muslims who are able to do so and it is the personal responsibility of each Muslim to ease the economic hardship of others and to strive towards eliminating inequality. Zakāt consists of spending a portion of wealth for the benefit of the poor or needy. A Muslim may donate more as an act of voluntary charity, There are five principles that should be followed when giving the zakāt, The giver must declare to God his intention to give the zakāt. The Quran is the central religious text of Islam, which Muslims believe to be a revelation from God. It is widely regarded as the finest work in classical Arabic literature, the Quran is divided into chapters, which are divided into verses. The word Quran occurs some 70 times in the text of the Quran, although different names, according to the traditional narrative, several companions of Muhammad served as scribes and were responsible for writing down the revelations. 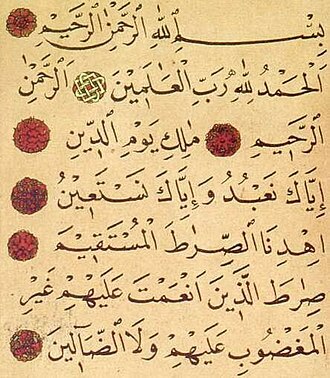 Shortly after Muhammads death, the Quran was compiled by his companions who wrote down and these codices had differences that motivated the Caliph Uthman to establish a standard version now known as Uthmans codex, which is generally considered the archetype of the Quran known today. There are, variant readings, with minor differences in meaning. The Quran assumes familiarity with major narratives recounted in the Biblical scriptures and it summarizes some, dwells at length on others and, in some cases, presents alternative accounts and interpretations of events. The Quran describes itself as a book of guidance and it sometimes offers detailed accounts of specific historical events, and it often emphasizes the moral significance of an event over its narrative sequence. The Quran is used along with the hadith to interpret sharia law, during prayers, the Quran is recited only in Arabic. Someone who has memorized the entire Quran is called a hafiz, some Muslims read Quranic ayah with elocution, which is often called tajwid. During the month of Ramadan, Muslims typically complete the recitation of the whole Quran during tarawih prayers, in order to extrapolate the meaning of a particular Quranic verse, most Muslims rely on the tafsir. The word qurʼān appears about 70 times in the Quran itself and it is a verbal noun of the Arabic verb qaraʼa, meaning he read or he recited. The Syriac equivalent is qeryānā, which refers to reading or lesson. While some Western scholars consider the word to be derived from the Syriac, regardless, it had become an Arabic term by Muhammads lifetime. A combination of Islam and feminism has been advocated as a feminist discourse and practice articulated within an Islamic paradigm by Margot Badran in 2002. There are substantial differences to be noted between the terms Islamic feminist and Islamist, any of these terms can be used of men or women. Islamic feminism is defined by Islamic scholars as being more radical than secular feminism, during recent times, the concept of Islamic feminism has grown further with Islamic groups looking to garner support from many aspects of society. In addition, educated Muslim women are striving to articulate their role in society, Islamists are advocates of political Islam, the notion that the Quran and hadith mandate a caliphate, i. e. an Islamic government. Some Islamists advocate womens rights in the public sphere but do not challenge gender inequality in the personal, suad al-Fatih al-Badawi, a Sudanese academic and Islamist politician, has argued that feminism is incompatible with taqwa, and thus Islam and feminism are mutually exclusive. During the early days of Islam in the 7th century CE, reforms in womens rights affected marriage, the Oxford Dictionary of Islam states that the general improvement of the status of women in Arab societies included prohibition of female infanticide and recognizing womens full personhood. Under Islamic law, marriage was no longer viewed as a status but rather as a contract, the dowry, previously regarded as a bride-price paid to the father, became a nuptial gift retained by the wife as part of her personal property. Women were given inheritance rights in a society that had previously restricted inheritance to male relatives. William Montgomery Watt states that Muhammad, in the context of his time, can be seen as a figure who testified on behalf of womens rights. Muhammad, however, by instituting rights of property ownership, inheritance and divorce, whilst the pre-modern period lacked a formal feminist movement, nevertheless a number of important figures argued for improving womens rights and autonomy. Women played an important role in the foundations of many Islamic educational institutions and this continued through to the Ayyubid dynasty in the 12th and 13th centuries, of 160 mosques and madrasahs established in Damascus, women funded 26 through the Waqf system. Half of all the patrons for these institutions were women. According to the Sunni scholar Ibn Asakir in the 12th century and he wrote that girls and women could study, earn ijazahs, and qualify as scholars and teachers. This was especially the case for learned and scholarly families, who wanted to ensure the highest possible education for both their sons and daughters, Ibn Asakir had himself studied under 80 different female teachers. Female education in the Islamic world was inspired by Muhammads wives, Khadijah, a businesswoman, and Aisha. Muhammad is said to have praised the women of Medina for their desire for knowledge, How splendid were the women of the ansar. While it was not common for women to enroll as students in classes, they did attend informal lectures and study sessions at mosques, madrasahs. Sufism or Taṣawwuf, which is often defined as Islamic mysticism, the inward dimension of Islam, or the phenomenon of mysticism within Islam, is a mystical trend in Islam characterized. These orders meet for sessions in meeting places known as zawiyas, khanqahs. They strive for ihsan as detailed in a hadith, Ihsan is to worship Allah as if you see Him, if you cant see Him, Rumi stated, The Sufi is hanging on to Muhammad, like Abu Bakr. Sufis regard Muhammad as al-Insān al-Kāmil, the perfect man who exemplifies the morality of God. The orders largely follow one of the four madhhabs of Sunni Islam, classical Sufis were characterized by their asceticism, especially by their attachment to dhikr, the practice of repeating the names of God, often performed after prayers. According to William Chittick, In a broad sense, Sufism can be described as the interiorization, Muslims have used the Arabic word taṣawwuf to identify the practice of Sufis. In this view, it is necessary to be a Muslim to be a true Sufi. However, Islamic scholars themselves are not by any means in agreement about the meaning of the word sufi, Sufis themselves claim that Tasawwuf is an aspect of Islam similar to Sharia, inseparable from Islam and an integral part of Islamic belief and practice. Classical Sufi scholars have defined Tasawwuf as a science whose objective is the reparation of the heart and turning it away from all else, two origins of the word sufi have been suggested. Commonly, the root of the word is traced to ṣafā. Another origin is ṣūf, wool in Arabic, referring to the simple cloaks the early Muslim ascetics wore, the two were combined by the Sufi al-Rudhabari, who said, The Sufi is the one who wears wool on top of purity. Scholars generally agree that ṣūf or wool is probably the word of Sufi. This term was given to them because they wore woollen garments, the term labisal-suf meant he clad himself in wool and applied to a person who renounced the world and became an ascetic. Others have suggested that the word comes from the term ahl aṣ-ṣuffah and these men and women who sat at al-Masjid an-Nabawi are considered by some to be the first Sufis. 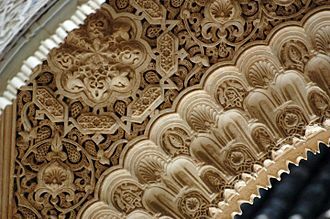 Islamic art encompasses the visual arts produced from the 7th century onward by people who lived within the territory that was inhabited by or ruled by culturally Islamic populations. The huge field of Islamic architecture is the subject of an article, leaving fields as varied as calligraphy, glass, pottery. Islamic art is not at all restricted to art, but includes all the art of the rich. It frequently includes secular elements and elements that are frowned upon, if not forbidden, figurative painting may cover religious scenes, but normally in essentially secular contexts such as the walls of palaces or illuminated books of poetry. 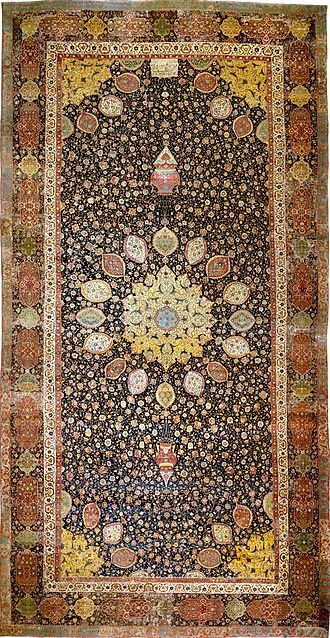 There are repeating elements in Islamic art, such as the use of floral or vegetal designs in a repetition known as the arabesque. 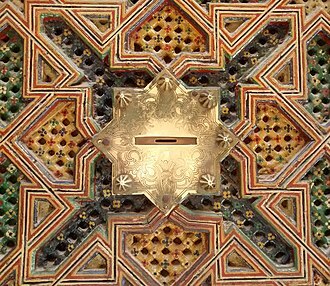 The arabesque in Islamic art is used to symbolize the transcendent, indivisible. Mistakes in repetitions may be introduced as a show of humility by artists who believe only God can produce perfection. Human portrayals can be found in all eras of Islamic art, above all in the private form of miniatures. Human representation for the purpose of worship is considered idolatry and is forbidden in some interpretations of Islamic law. There are depictions of Muhammad, Islams chief prophet. Small decorative figures of animals and humans, especially if they are hunting the animals, are found on pieces in many media from many periods. Other inscriptions include verses of poetry, and inscriptions recording ownership or donation, Islamic calligraphy in the form of painting or sculptures are sometimes referred to as quranic art. Large inscriptions made from tiles, sometimes with the letters raised in relief, complex carved calligraphy decorates buildings. For most of the Islamic period the majority of coins only showed lettering, the tughra or monogram of an Ottoman sultan was used extensively on official documents, with very elaborate decoration for important ones. Other single sheets of calligraphy, designed for albums, might contain short poems, Quranic verses, or other texts. The main languages, all using Arabic script, are Arabic, always used for Quranic verses, Persian in the Persianate world, especially for poetry, calligraphers usually had a higher status than other artists. Muhammad requests Maalik to show him Hell during his heavenly journey. Miniature from The David Collection. The four main salat postures and associated prayers and recitations. Yemeni prayer during North Yemen Civil War. Mir Sayyid Ali, a scholar writing a commentary on the Quran, during the reign of the Mughal Emperor Shah Jahan. 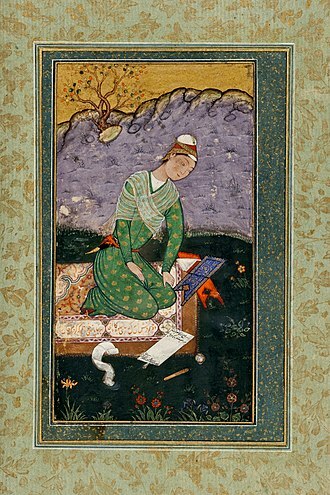 A Persian miniature of Shah Abu'l Ma‘ali a scholar. Juristic exchange between Abu Dawood and Ibn Hanbal. One of the oldest literary manuscripts of the Islamic world, dated October 879. Shariah Court in Malacca, Malaysia. The Mosque of Uqba (Great Mosque of Kairouan), founded by the Umayyad general Uqba Ibn Nafi in 670, is the oldest and most prestigious mosque in the Muslim West; its present form dates from the 9th century, Kairouan, Tunisia. An Arabic manuscript written under the second half of the Abbasid Era. Minaret at the Great Mosque of Samarra. The birthplace of Muhammad. After his migration, the house was taken and sold by Aqil ibn Abi Talib. In modern times, the house was demolished and converted into a library in 1951. Al-Aqsa Mosque, in the Old City of Jerusalem, is said to be the location to which Muhammad traveled in his night journey. 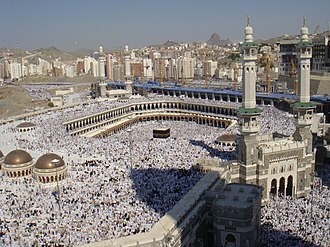 The location is the third holiest place for the Muslims. The Taj Mahal in Agra, India, is one of the finest example of Indo-Islamic culture and architecture. The Tabula Rogeriana, drawn by Al-Idrisi in 1154, one of the most advanced ancient world maps. Al-Idrisi also wrote about the diverse Muslim communities found in various lands. Ibn Rushd (Averroes) Muslim polymath from Spain. 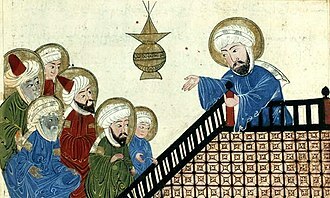 Muhammad prohibiting Nasī'. Found in an illustrated copy of Al-Bīrūnī's The Remaining Signs of Past Centuries (17th-century copy of an early 14th-century Ilkhanid manuscript). A Mughal miniature dated from the early 1620s depicting the Mughal emperor Jahangir (d. 1627) preferring an audience with Sufi saint to his contemporaries, the Ottoman Sultan and the King of England James I (d. 1625); the picture is inscribed in Persian: "Though outwardly shahs stand before him, he fixes his gazes on dervishes." 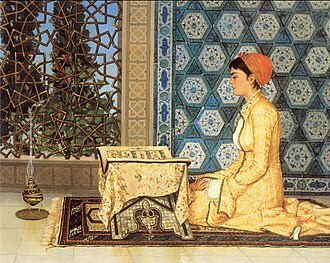 Girl Reciting the Qur'ān (Kuran Okuyan Kız), an 1880 painting by the Ottoman polymath Osman Hamdi Bey, whose works often showed women engaged in educational activities. 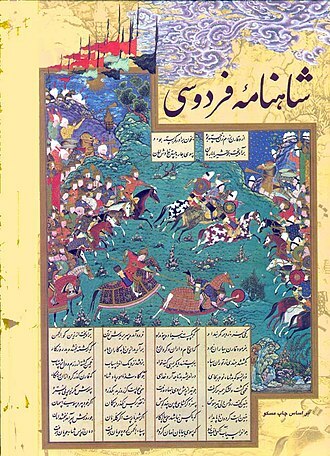 A fifteenth-century Persian miniature depiciting the Battle of the Camel, a decisive encounter between the troops of the fourth caliph 'Alī, and an opposing army rallied by Muḥammad's wife, Āʿisha. In the aftermath of Alī's victory, Āʿisha withdrew from politics. Traditionalists have used this episode to argue that women should not play an active political role, while modernists have held up Āʿisha's legacy in arguing for gender equity in the Islamic tradition. Pakistani school girls in Khyber Pakhtunkhwa. Elementary schoolgirls from OIC member state Albania pictured during Code Week 2017 in Burrel, near Tirana. Between 2009 and 2015, Albania saw consistent and substantial improvements in all three PISA subjects. The Abbasids are known to have founded some of the world's earliest educational institutions such as the House of Wisdom. A panorama in 12 folds showing a fabulous Eid ul-Fitr procession by Muslims in the Mughal Empire. 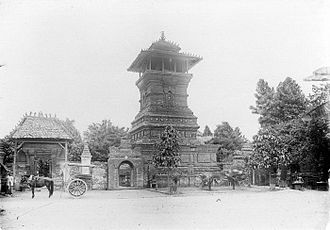 Minaret of the Menara Kudus Mosque, influenced by both Islamic and mainly Hindu-Buddhist temple-like Javanese structure. Afghan politicians and foreign diplomats praying (making salah) at the U.S. Embassy in Kabul, Afghanistan. 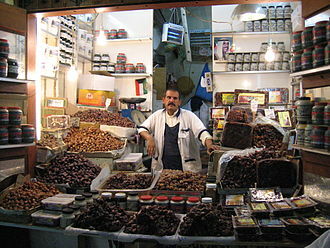 Muslims traditionally break their fasts in the month of Ramadan with dates (like those offered by this date seller in Kuwait City), as was the recorded practice (Sunnah) of Muhammad. A photograph of a slave boy in the Sultanate of Zanzibar. 'An Arab master's punishment for a slight offence.' c. 1890. From at least the 1860s onwards, photography was a powerful weapon in the abolitionist arsenal. 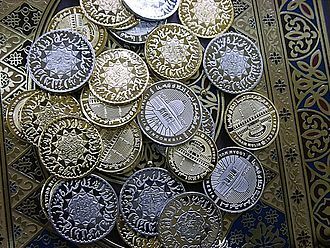 Silver or gold coinage are one way of granting zakat. Sa`d ibn Abi Waqqas leads the armies of the Rashidun Caliphate during the Battle of al-Qādisiyyah from a manuscript of the Shahnameh. The three dimensions of Islam including iman. A single raised index finger, around the world generally signifying power and victory. Diagram of "Plain of Assembly"(Ard al-Hashr) on the Day of Judgment, from autograph manuscript of Futuhat al-Makkiyya by Sufi mystic and philosopher Ibn Arabi, ca. 1238. Shown are the 'Arsh (Throne of God), pulpits for the righteous (al-Aminun), seven rows of angels, Gabriel (al-Ruh), A'raf (the Barrier), the Pond of Abundance, al-Maqam al-Mahmud (the Praiseworthy Station; where the prophet Muhammad will stand to intercede for the faithful), Mizan (the Scale), As-Sirāt (the Bridge), Jahannam (Hell) and Marj al-Jannat (Meadow of Paradise). Pharaoh watches a serpent devour a demon in the presence of Musa; from a manuscript of Qisas al-Anbiya, c. 1540.